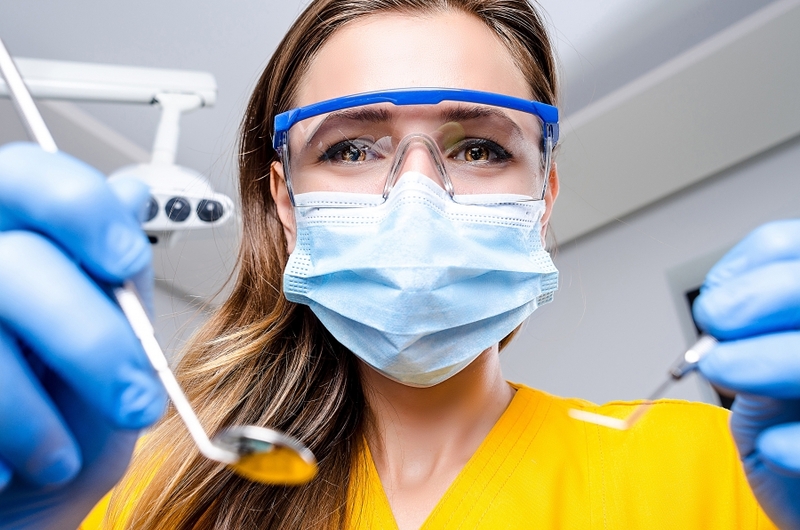 In a previous blog, the Gaithersburg dentists at Clopper’s Mill Dental Care discussed the meaning behind dental anxiety, and how people can overcome their fears of the dentist’s office. But why do people have dental anxiety in the first place? In this blog, we’ll examine some of the underlying reasons behind dental phobia that lead people to have unpleasant and scary dental experiences, or cause them to avoid the dentist altogether. Unfortunately, skipping out on your routine dental checkups will only lead to more stressful and painful visits to the dentist (or the oral surgeon) in the future—so confronting and overcoming your dental anxiety is of utmost importance for your health. This is perhaps the most common cause of dental anxiety—after all, who really likes pain? Many dental surveys report that the large majority of people surveyed list pain as their number one fear when going to the dentist. The dentist isn’t always pain-free—but if you make regular visits to your dentist twice a year, you’re dramatically decreasing the risk that you’ll develop an oral health ailment that will lead to pain in your mouth. It’s also important to note that dental technology has come a long way in the past decade or two—”pain-free dentistry” has made procedures that were once uncomfortable and painful simple and easy. You might think a procedure will hurt, but there’s a very good chance that you’ll be just fine! When a dentist you barely know starts placing sharp tools inside your mouth, it’s understandable that you might feel like your well-being is out of your control. A fear of losing control is very common in the dental world and beyond—for example, many people experience the same “loss of control anxiety” when flying in an airplane or allowing someone else to take the wheel during a road trip. Some people with more extreme cases of loss of control anxiety will feel nearly constant stress from losing control in everyday life! For dental patients with this anxiety, it can be very difficult to sit back and relax in the dental chair and allow a dentist to check things out in your mouth. What if they make a mistake? What if they accidentally cause injury to my teeth or mouth? Ultimately, it’s important to remember that dental care is an absolute necessity for your overall health—and there’s nobody more qualified to take care of your teeth and mouth than a dentist. Sacrificing a little control for your health might be difficult at first—but avoiding the dentist altogether with make you lose control of your oral health. The choice is yours. While you can’t live on this earth without talking, smiling, laughing, and yawning, there’s still something inherently intimate and private about the inside of your mouth. Maybe you’re a little bit self-conscious about how your teeth look, or you’re worried that the dentist will find an oral health problem that will make you look unhealthy or irresponsible. Scenarios like this can lead people to feel embarrassed when they go to the dentist— and in some cases, can keep people from visiting the dentist entirely. Dentists have seen it all—the biggest cavities, the worst gum disease, tooth loss, severe halitosis, and even the effects of methamphetamine on teeth. Whatever is in your mouth is not going to be surprising, laughable, or disgusting to them. In fact, they take every dental situation seriously to make sure that your smile is healthy so you have nothing to be embarrassed about. Their goal is to give you confidence and make you feel less embarrassed! Take advantage of this, and stop by your dentist twice a year so you have no reason not to show off those pearly whites. Dentists are humans, too—they make mistakes, have bad days, and are occasionally grumpy. Some dentists, like some humans, are grumpy and mean all the time, which can leave patients with some negative and traumatic dental experiences. There’s also the possibility that, as a kid, you had an extremely painful or stressful dental experience that you never got over. You’ll never forget how terrified you were in the dentist’s chair, even though it might’ve been decades ago. Ultimately, it’s important to keep a few things in mind to face your dental anxiety and put your past traumatic dental experiences in perspective. First, the faults of your childhood dentist or your last dentist do not apply to your new dentist. Second, there’s a good chance your dental experience as a child was scary because it was a new, unknown experience—not because you had a painful oral health problem. Keep these things in mind as you make future trips to the dentist’s office—it might not be as scary as you think it will be. Pay a visit to Clopper’s Mill Dental Care! At Clopper’s Mill Dental Care, we understand that many of our patients have dental anxiety to some degree. Even some of our staff members deal with stress in the dentist’s chair! That’s why we take extra steps to make sure our patients are comfortable and calm through every part of the dental process. If you have any questions about how we handle patients with anxiety, just give us a call and talk to your dentist before your checkup or procedure—we’re happy to accommodate your needs and make your visit to Clopper’s mill as easy as possible!